Good hoteliers know that, these days, most of their guests are sharing their experiences on social media. The answer for the hospitality industry is to help facilitate their guests' online interactions by offering better ways to connect along with something good to write home about. Royal Caribbean, one of the world's largest cruise operators is in front of this curve, billing its "Quantum of the Seas" as the world's first smart ship. Launching this month, the experience starts with high-speed Internet, a necessity which is extremely expensive on other cruise ships, if it is available at all. Upon boarding, passengers are fitted with rubberized radio frequency identification (RFID) bracelets that are used as digital wallets for purchases, track reservations, and even open keyless door locks. 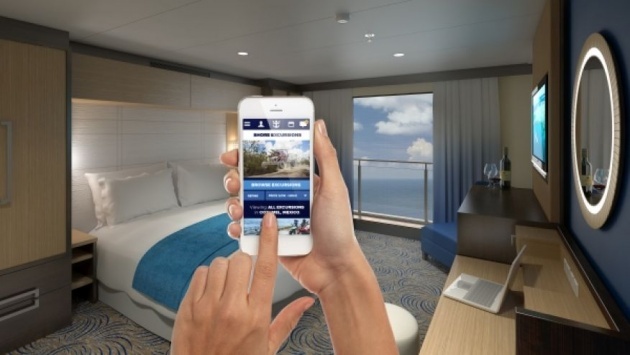 Best of all are the ship's virtual balconies: wall-sized, high-resolution screens in otherwise windowless staterooms that display real-time feeds from permanently mounted cameras on the outside of the ship.